The Lewis and Clark Expedition (1804–1806) was the first United States transcontinental expedition and second overland journey to the Pacific coast, following the 1793 expedition by the Scotman Alexander Mackenzie, who reached the Pacific from Montreal. Commissioned by President Thomas Jefferson following the acquisition of vast western territories from France known as the Louisiana Purchase, the expedition, called the Corps of Discovery, was led by Captain Meriwether Lewis, a frontiersman and personal secretary of Jefferson, and Second Lieutenant William Clark of the United States Army. The expedition sought to provide details about the newly acquired lands, specifically if the Mississippi-Missouri river system shared proximate sources with the Columbia River in the Pacific Northwest. During the two-year overland journey, the explorers discovered some 300 new species, encountered 50 unknown Indian tribes, and confirmed that the Rocky Mountain chain extended thousands of miles north from Mexico. Traveling through remote and hostile Indian lands in a 4,000-mile wilderness trek, the expedition lost only one man, to appendicitis. The expedition set up diplomatic relations with the Native Americans with the help of the Shoshone Indian woman Sacajawea, who joined the expedition with her French husband and infant child. The explorers dramatically advanced knowledge of the interior of the continent, discovering and mapping navigable rivers, mountains, and other varied landscapes. The Corps of Discovery charted an initial pathway for the new nation to spread westward, spawning a pattern of pioneer settlement that would become one of the defining attributes of the United States. The initial expedition and the publication of the explorers' journals would prompt Americans to go west in search of greater economic opportunities, transforming virgin forests and grasslands into farmlands, towns, and cities. No longer bound to the Atlantic seaboard, the nation would become a continental power as new states fashioned from the territories brought resources and productivity that would raise the country to preeminence by the beginning of the twentieth century. 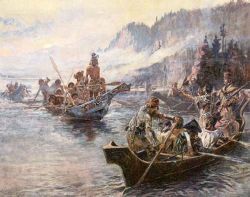 The displacement of Native Americans from their traditional lands that commenced with English colonization along the Atlantic seaboard further accelerated as pioneers followed the explorations of Lewis and Clark. Treaties between the U.S. government and various Indian tribes were repeatedly violated as settlers moved into sparsely populated Indian lands. Both sides committed atrocities in the ensuing conflicts. The Indians were numerically and technologically unequal to American military forces, however, and were eventually absorbed or placed on reservations. U.S. President Thomas Jefferson had long considered an expedition to explore the North American continent. When he was Minister to France following the American Revolutionary War, from 1785-1789, he had heard numerous plans to explore the Pacific Northwest. In 1785, Jefferson learned that King Louis XVI of France planned to send a mission there, reportedly as a scientific expedition. Jefferson found that doubtful, and evidence provided by the former commander of the fledgling United States Navy and later admiral of the Russian Navy, John Paul Jones, confirmed these doubts. In either event, the mission was destroyed by bad weather after leaving Botany Bay in Sydney, New South Wales, Australia in 1788. In 1803, then President Jefferson negotiated the acquisition of 828,000 square miles of western territory from France. The Louisiana Purchase, at the total cost of approximately $24 million, roughly doubled the size of the United States and in the view of Napoleon Bonaparte "affirm[ed] forever the power of the United States[;] I have given England a maritime rival who sooner or later will humble her pride." A few weeks after the purchase, Jefferson, an advocate of western expansion, had the Congress appropriate twenty five hundred dollars, "to send intelligent officers with ten or twelve men, to explore even to the Western ocean." They were to study the Native American tribes, botany, geology, Western terrain, and wildlife in the region, as well as evaluate the potential interference of British and French Canadian hunters and trappers who were already well established in the area. The expedition was not the first to cross North America, but was roughly a decade after the expedition of Alexander MacKenzie, the first European to cross north of Mexico to the Pacific Ocean, in 1793. In a message to Congress, Jefferson wrote, "The river Missouri, and Indians inhabiting it, are not as well known as rendered desirable by their connection with the Mississippi, and consequently with us…. An intelligent officer, with ten or twelve chosen men … might explore the whole line, even to the Western Ocean." 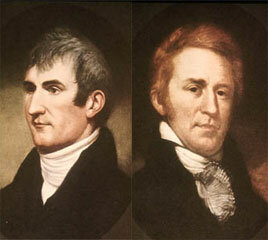 Jefferson selected Captain Meriwether Lewis to lead the expedition, afterward known as the Corps of Discovery; Lewis selected William Clark as his partner. Because of bureaucratic delays in the United States Army, Clark officially only held the rank of Second Lieutenant at the time, but Lewis concealed this from the men and shared the leadership of the expedition, always referring to Clark as "Captain." In a letter dated June 20, 1803, Jefferson wrote to Lewis, "The object of your mission is to explore the Missouri river, and such principal stream of it as by its course and communication with the waters of the Pacific ocean whether the Columbia, Oregon, Colorado. or any other river may offer the most direct and practicable water communication across this continent for the purposes of commerce. The group, initially consisting of thirty three members, departed from Camp Dubois, near present day Hartford, Illinois, and began their historic journey on May 14, 1804. They soon met with Lewis in Saint Charles, Missouri, and the approximately forty men followed the Missouri River westward. Soon they passed La Charrette, the last white settlement on the Missouri River. The expedition followed the Missouri through what is now Kansas City, Missouri, and Omaha, Nebraska. On August 20, 1804, the Corps of Discovery suffered its only death when Sergeant Charles Floyd died, apparently from acute appendicitis. He was buried at Floyd's Bluff, near what is now Sioux City, Iowa. During the final week of August, Lewis and Clark had reached the edge of the Great Plains, a place abounding with elk, deer, buffalo, and beavers. They were also entering Sioux territory. The first tribe of Sioux they met, the Yankton Sioux, were more peaceful than their neighbors further west along the Missouri River, the Teton Sioux, also known as the Lakota. The Yankton Sioux were disappointed by the gifts they received from Lewis and Clark—five medals—and gave the explorers a warning about the upriver Teton Sioux. The Teton Sioux received their gifts with ill-disguised hostility. One chief demanded a boat from Lewis and Clark as the price to be paid for passage through their territory. As the Native Americans became more dangerous, Lewis and Clark prepared to fight back. At the last moment before fighting began, the two sides fell back. The Americans quickly continued westward (upriver) until winter stopped them at the Mandan tribe's territory. In the winter of 1804–05, the party built Fort Mandan, near present-day Washburn, North Dakota. During their stay with the peaceful Mandans they were joined by a French Canadian trapper, Toussaint Charbonneau, and his Shoshone/Hidatsa wife, Sacagawea. Sacagawea had enough command of French to enable the group to talk to her Shoshone tribe as well as neighboring tribes from further west (she was the chief's sister), and to trade food for gold and jewelry. (As was common during those times, she had been taken as a slave by the Hidatsa at a young age, and reunited with her brother on the journey). The inclusion of a woman with a young baby (Sacagawea's son, Jean Baptiste Charbonneau, born in the winter of 1804-05) helped to soften tribal relations since no war-party would include a woman and baby. In April 1805, some members of the expedition were sent back home from Mandan with them went a report about what Lewis and Clark had discovered, 108 botanical specimens (including some living animals), 68 mineral specimens, and Clark's map of the territory. Other specimens were sent back to Jefferson periodically, including a prairie dog which Jefferson received alive in a box. The expedition continued to follow the Missouri to its headwaters and over the Continental Divide at Lemhi Pass via horses. In canoes, they descended the mountains by the Clearwater River, the Snake River, and the Columbia River, past Celilo Falls and past what is now Portland, Oregon. At this point, Lewis spotted Mt. Hood, a mountain close to the ocean. On a big pine, Clark carved, "William Clark December 3rd 1805. By land from the U.States in 1804 & 1805." Clark had written in his journal, "Ocian [sic] in view! O! The Joy!" One journal entry is captioned "Cape Disappointment" at the Entrance of the Columbia River into the Great South Sea or "Pacific Ocean." By that time the expedition faced its second bitter winter during the trip, so the group decided to vote on whether to camp on the north or south side of the Columbia River. The party agreed to camp on the south side of the river (modern Astoria, Oregon), building Fort Clatsop as their winter quarters. While wintering at the fort, the men prepared for the trip home by boiling salt from the ocean, hunting elk and other wildlife, and interacting with the native tribes. The 1805-06 winter was very rainy, and the men had a hard time finding suitable meat. Surprisingly, they never consumed much Pacific salmon. The explorers started their journey home on March 23, 1806. On the way home, Lewis and Clark used four dugout canoes they bought from the Native Americans, plus one that they stole in "retaliation" for a previous theft. Less than a month after leaving Fort Clatsop, they abandoned their canoes because portaging around all the falls proved too difficult. On July 3, after crossing the Continental Divide, the Corps split into two teams so Lewis could explore the Marias River. Lewis' group of four met some Blackfeet Natives. Their meeting was cordial, but during the night, the Blackfeet tried to steal their weapons. In the struggle, two Indians were killed, the only native deaths attributable to the expedition. The group of four—Lewis, Drouillard, and the Field brothers—fled over one hundred miles in a day before they camped again. Clark, meanwhile, had entered Crow territory. Lewis and Clark remained separated until they reached the confluence of the Yellowstone and Missouri Rivers on August 11. While reuniting, one of Clark's hunters, Pierre Cruzatte, blind in one eye and nearsighted in the other, mistook Lewis for an elk and fired, injuring Lewis in the thigh. From there, the groups were reunited and able to quickly return home by the Missouri River. They reached St. Louis on September 23, 1806. The Corps of Discovery returned with important information about the new United States territory and the people who lived in it, as well as its rivers and mountains, plants and animals. The expedition made a major contribution to mapping the North American continent. On December 8, 1803, Lewis met with the Spanish lieutenant governor of Upper Louisiana, Colonel Carlos Dehault Delassus. The territory was still nominally governed by Spaniards, although Spain had ceded Louisiana to France under the condition that France would not give it to a third party. Spain wanted to keep the territory as an empty buffer between the United States and the many mineral mines in northern Mexico. Thus Delassus refused to let Lewis go up the Missouri until France formally took control of the territory, at which time France would formally transfer it to the United States. Lewis had intended to spend the winter in St. Louis since he needed to gain provisions for the trip and it was too late in the year to sensibly continue on the Missouri. Despite Lewis’ claims that the Expedition was solely a scientific one that would only travel the Missouri territory, Delassus wrote to his superiors that Lewis would undoubtedly go as far as the Pacific coast, citing that Lewis was far too competent for a lesser mission. Jefferson was willing for Lewis to winter in St. Louis rather than continue up the Missouri; Lewis could gain valuable information in St. Louis and draw from Army supplies rather than the Expedition’s. The fact that the Expedition would travel a northern route was done for political reasons. It was imperative to stay out of Spanish territory, yet this meant that the Expedition could not use the best mountain passes. Lolo Pass, which the Expedition used, would never see a wagon use it and even today it is a rough way to cross the Rockies. After the start of the expedition, Spain sent at least four different missions to stop Lewis and Clark. During the Expedition’s stay in the Shoshone’s camps, the expedition was told they were ten days away from Spanish settlements. This warning helped Lewis and Clark stay away from the Spanish, but they never knew the Spanish had sent missions to stop them until after they returned from the journey. On August 11, 1806, near the end of the expedition, Lewis was shot in the left thigh by Pierre Cruzatte, a near-blind man under his command, while both were hunting for elk. His wound hampered him for the rest of the journey. After returning from the expedition, Lewis received a reward of 1,400 acres of land. In 1807, Jefferson appointed him governor of the Louisiana Territory and he settled in St. Louis. Lewis proved to be a poor administrator, often quarreling with local political leaders and failing to keep in touch with his superiors in Washington. Lewis died under mysterious circumstances of two gunshot wounds in 1809, at at a tavern about 70 miles from Nashville, Tennessee, while in route to Washington to answer complaints about his actions as governor. Whether Lewis committed suicide or was murdered is still disputed. The explorer was buried not far from where he died. He is honored today by a memorial along the Natchez Trace Parkway. Yet his contributions to science and the explorations of the West are considered incalculable. Of courage undaunted, possessing a firmness and perseverance of purpose which nothing but impossibilities could divert from its direction, … honest, disinterested, liberal, of sound understanding and a fidelity to truth so scrupulous that whatever he should report would be as certain as if seen by ourselves, with all these qualifications as if selected and implanted by nature in one body for this express purpose, I could have no hesitation in confiding the enterprise to him. William Clark was appointed the brigadier general of the militia in the Louisiana Territory in 1807, which made him the agent for Indian affairs. He set up his headquarters in St. Louis. During the War of 1812, he led several campaigns, among them in 1814 one along the Mississippi River, up to the Prairie du Chien-area, where he established short lived Fort Shelby, the first post in what is now Wisconsin. It was captured by the British soon after. When the Missouri Territory was formed in 1813, Clark was appointed governor. When Missouri became a state in 1820, Clark was defeated in the run for governor but in 1822 he was appointed Superintendent of Indian Affairs by president James Monroe, a new position created by Congress after the Factory (fur trade) system was abolished. Clark remained in that capacity until his death, although his title changed with the creation of the Office of Indian Affairs, in 1824, and finally the Bureau of Indian Affairs in 1829, both within the War Department. In 1824/25, he was additionally appointed surveyor general of Illinois, Missouri and the Territory of Arkansas. The Lewis and Clark Expedition was an event that triggered major developments in the early history of the United States. The reports of new discoveries and shipment of unknown species of plants and animals to the scientifically minded President Jefferson excited the public and stirred dreams of adventure, and profit. 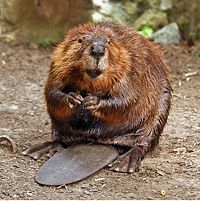 Trapping, predominantly beaver, had long been an important cash industry, as the American and Canadian wilderness supplied European society with coveted fur. With the return of the Lewis and Clark expedition, not only did an overland trade route to the fur-rich Pacific Northwest become feasible, the interior lands were recognized as an untapped resource for the valuable pelts. The financier John Jacob Astor established the American Fur Company in 1808,and three years later founded the Columbia River trading post at Fort Astoria, the first United States community on the Pacific coast. Astor financed an overland expedition in 1810-12, which used the journals of Lewis and Clark to discover the critical South Pass through which hundreds of thousands settlers would later pass on the way to Oregon and California. Following this economic beachhead, a generation of mountain men would filter into the vast Rocky Mountain chain. Driven by adventure and hopes for profit, mountain men lived in guarded proximity with Indians, learning their customs and languages, and remaining long after the beaver were virtually eradicated. A critical link in the westward migration, the mountain men were later employed as guides for wagon trains crossing the mountains, and even served as Indian agents for the federal government. Following the Lewis and Clark expedition, further exploration, growing commerce, and expanding settlement of the American West, including California and the Oregon Territory, which was not part of the original Louisiana Purchase, would bring the nation to the Pacific and lay the foundation for the emergence of the United States in the twentieth century as the world's preeminent power. ↑ Lewis and Clark and the Revealing of America, Jefferson's Secret Message to Congress. Retrieved November 23, 2018. ↑ Lewis and Clark and the Revealing of America, Jefferson's Instructions for Meriwether Lewis. Retrieved November 23, 2018. ↑ Bernard deVoto, The Course of Empire (Boston: Houghton Mifflin, 1962, ISBN 0395924987). ↑ Stephen Ambrose, Undaunted Courage (New York: Simon & Schuster, 1997, ISBN 0684826976), 122-123. ↑ Anthony Brandt, "Reliving Lewis and Clark: Louisiana Purchase Ceremony" (National Geographic News, March 23, 2004). ↑ PBS, The West—Meriwether Lewis. Retrieved November 23, 2018. ↑ John D. W. Guice, James J. Holmberg, and Jay H. Buckley, By His Own Hand? The Mysterious Death of Meriwether Lewis (University of Oklahoma Press, 2006). ↑ Donald Dean Jackson (ed. ), Letters of the Lewis and Clark Expedition with Related Documents: 1783–1854, (Urbana: University of Illinois Press, 1979, ISBN 978-0252006975), 589–590. ↑ Jay H. Buckley, William Clark: Indian Diplomat (Norman: University of Oklahoma Press, 2008). Ambrose, Stephen. Undaunted Courage. New York: Simon & Schuster, 1997. ISBN 0684826976. Betts, Robert B. In Search of York: The Slave Who Went to the Pacific With Lewis and Clark. Boulder: University Press of Colorado, Lewis and Clark Trail Heritage Foundation, 2002. ISBN 0870817140. Buckley, Jay H. William Clark: Indian Diplomat. University of Oklahoma Press, 2010. ISBN 978-0806141459. Burns, Ken. Lewis & Clark: An Illustrated History. New York: Knopf, 1997. ISBN 0679454500.
deVoto, Bernard. The Course of Empire. Boston: Houghton Mifflin, 1962. ISBN 0395924987. Guice, John D.W., James J. Holmberg, and Jay H. Buckley. By His Own Hand? The Mysterious Death of Meriwether Lewis. University of Oklahoma Press, 2006. ISBN 978-0806138510. Jackson, Donald Dean (ed.). Letters of the Lewis and Clark Expedition, with Related Documents, 1783-1854. University of Illinois Press, 1979. ISBN 978-0252006975. Moulton, Gary E. (ed.). The Lewis and Clark Journals: An American Epic of Discovery. Lincoln: University of Nebraska Press, 2003. ISBN 080322950X. Moulton, Gary E. (ed.). The Journals of the Lewis and Clark Expedition. Lincoln: University of Nebraska Press, 2002. ISBN 978-0803229501. Ronda, James P. Lewis and Clark Among the Indians. Lincoln: University of Nebraska Press, 1984. ISBN 978-0803289901. Schmidt, Thomas. National Geographic Guide to the Lewis & Clark Trail. Washington, DC: National Geographic, 2002. ISBN 0792264711. "Lewis and Clark: The National Bicentennial Exhibition" Missouri Historical Society. "Lewis and Clark, Mapping the West" Smithsonian Institution. "The Journey of the Corp of Discovery" pbs.org. "Dicovery paths" Discovering Lewis and Clark. "Lewis and Clark National Historic Trail" United States National Park Service. "Helena-Lewis and Clark National Forest" USDA Forest Center. "Lewis and Clark in Kentucky" The Kentucky Lewis and Clark Bicentennial Commission. 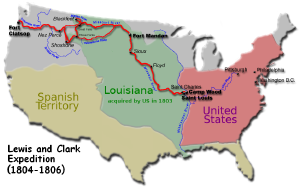 History of "Lewis and Clark Expedition"
This page was last modified on 27 November 2018, at 19:02.